Named “Small Business of the Year” by the Lynchburg Regional Business Alliance. Dr. Likins has also been consistently voted “Lynchburg’s Best Chiropractor” by the readers of Lynchburg Living Magazine. "I really enjoy restoring people to their full potential." A college football injury led Dr. Will Likins to his calling as a chiropractor. Unlike painkillers, chiropractic treated his pain for good and he set out to help others restore their health naturally too. He graduated with a degree in biology from West Virginia University and received a doctorate in chiropractic from Cleveland Chiropractic College. Dr. Likins is also an approved Veterans Affairs Doctor, a licensed personal trainer and a nutritional consultant through the American Council on Exercise. He's spoken locally and nationally on the benefits of chiropractic and health management. Dr. Likins has been in private practice in Lynchburg for more than 17 years and looks forward to serving patients for years to come. "Between my co-workers and our patients, we all feel like family here!" 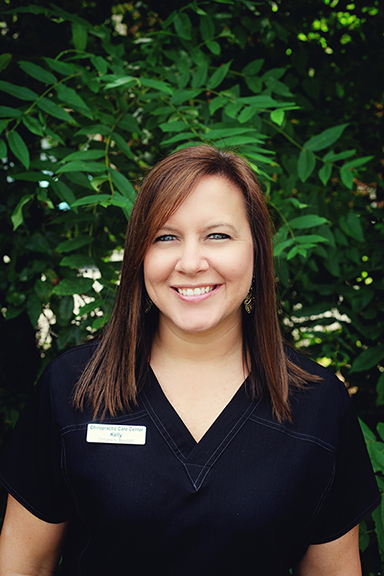 For more than 15 years, Kelly has enjoyed meeting new people at Chiropractic Care Center. She finds it incredibly rewarding to watch them get better with chiropractic care. Outside of work, Kelly enjoys spending time with her husband, Josh, and two daughters, Kylie and Kinley. She also loves watching her daughter play softball and, when possible, enjoys hunting. Tayler has worked at Chiropractic Care Center for more than four years. She genuinely loves getting to know the patients and enjoys helping people get well. Outside of work, Tayler enjoys spending time with her husband and daughter, Avery. She also loves traveling and doing CrossFit at the Jamerson YMCA.